Students and faculty members aboard ORCA's research vessel the Phocoena. During her last two years of high school (2013-2015) Laura attended a private program for high school students to earn college credits. The Bill and Melinda Gates Foundation funded the Ocean Research College Academy (ORCA) in 2004. At ORCA she participated in monthly State of Possession Sound (SOPS) cruises to collect data that provided insight on the health of the local ecosystem. These data that have been collected throughout the past decade are now being used by the Washington State Ferry system. They are using these data as a reference for the baseline health of the local ecosystem in Mukilteo as a new ferry terminal is being constructed (1, 2, 3). 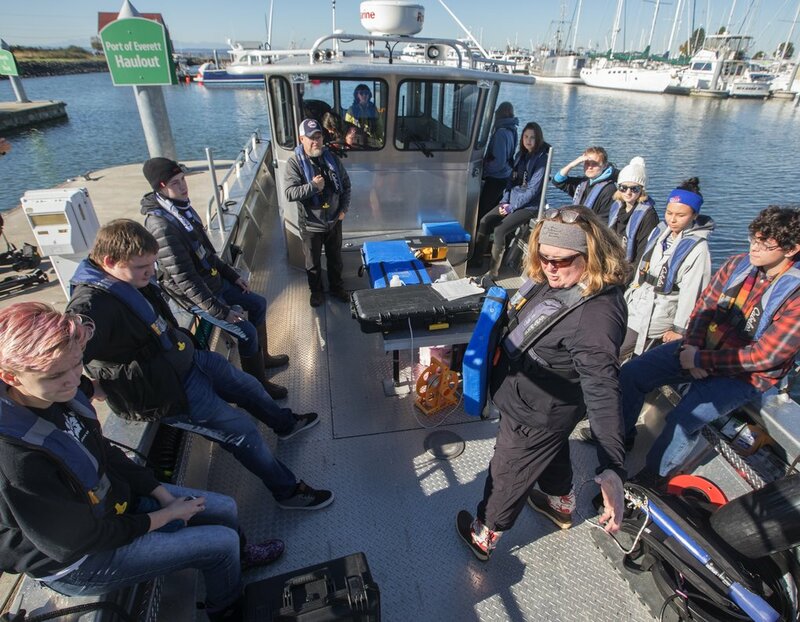 During SOPS cruises, ORCA students collected samples of water to analyze nutrient contents, dissolved oxygen levels, turbidity, temperature, pH, and salinity via YSI instruments and Niskin bottles. Marine mammals and species of birds were recorded, and sediment and plankton samples were collected as well. Students at ORCA continue to collect these data on a bi-monthly basis. Laura's previous experience as an intern at the Everett Environmental Laboratory expanded her learning and skills in many ways (see Work Experience page). This internship provided her with experience operating an Agilent ICP-MS in order to analyze water, biological tissue, soil, and other various samples. This experience sparked Laura's interest in chemistry, which is she is now majoring in. She is pursuing degrees in Chemistry with a an emphasis in Biochemistry (B.Sc. ), Physics (B.A. ), and a minor in Mathematics at Pacific Lutheran University. ​Laura has continued marine research at PLU with Dr. Sheri Tonn. They are assessing the lasting effects of the American Smelting and Refining Company (ASARCO) Smelter that was located in Commencement Bay (Tacoma, WA). The smelter was in operation from 1890-1985. Their research is looking at the legacy effects of the plant by analyzing heavy metal concentrations in mussel tissue. The primary metals of interest are arsenic, cadmium, lead, and zinc. In continuing pursuit of higher education, Laura has recently finished applications to oceanography graduate school programs. Sonogoshira Coupling product: 1-(hex-1-ynyl)-4-nitrobenzene from 1-iodo-4-nitrobenzene and 1-hexyne.